Fishing and conservation groups this week announced intentions to seek a legal declaration that the federal government's plan to protect threatened and endangered Columbia and Snake river salmon and steelhead fails to achieve dictates of the Endangered Species Act. The Tuesday announcement of the filing of a proposed "seventh" amended complaint against three federal agencies would stir up a legal battle waged off and on, but mostly on, since 2001. The challenge is the fourth filed over the past 13 years in U.S. District Court for the District of Oregon asking that Federal Columbia River Power System biological opinions prepared by NOAA Fisheries be overturned. Three previous plans have been remanded to NOAA Fisheries so flaws noted by the court could be repaired. To read the complaint or for other information go to: www.wildsalmon.org (PDF). The 13 conservation and fishing groups say that the "supplemental" BiOp issued in January merely rolls over inadequate and illegal strategies incased in BiOps issued in 2008 and 2010. Judge James A. Redden in 2011 remanded the 2008 BiOp and its 2010 supplement. "This latest blueprint is virtually indistinguishable from the plan rejected by the district court in 2011, not to mention the several illegal plans before that," said James Bogaard, Save Our Wild Salmon executive director. "Rather than looking for ways to do what's needed to safeguard imperiled salmon and bring people together, the federal agencies have opted to stick with a failed framework while trying an end-run around good science." "Salmon groups have no choice but to hold the government accountable and ensure at-risk salmon and steelhead populations receive protections under the Endangered Species Act," Bogaard said. The proposed complaint also faults the U.S. Army Corps of Engineers and Bureau of Reclamation for issuing 2014 records of decision that adopt the terms of the new BiOps. The plaintiffs say the BiOp and the RODs violate the ESA, the National Environmental Policy Act and the Administrative Procedure Act. The Corps and Bureau operate the dams in the FCRPS and they, along with the Bonneville Power Administration, are required by the ESA to consult with NOAA Fisheries during the development of BiOps related to dam operations. BiOps judge impacts of federal actions, such as the existence and operation of the hydro projects, on ESA listed species. The most recent FCRPS BiOps have for the most part decided that the FCRPS' system of dams does jeopardize the survival of listed Columbia basin salmon and steelhead stocks, but have outlined mitigation actions to both improve survival within the system and off-site. The 2008 BiOp and 2010 and 2014 supplements have focused on improving tributary and estuary habitat, and as a result survival and productivity. The proposed seventh amended complaint says "there is no credible or reliable scientific basis for predicting the numerically precise survival improvements from specific tributary habitat actions that NOAA developed and relies on to conclude the RPA will avoid jeopardy." The "reasonable and prudent alternative" describes actions the agency feels would eliminate the jeopardy posed to 13 listed salmon and steelhead stocks. 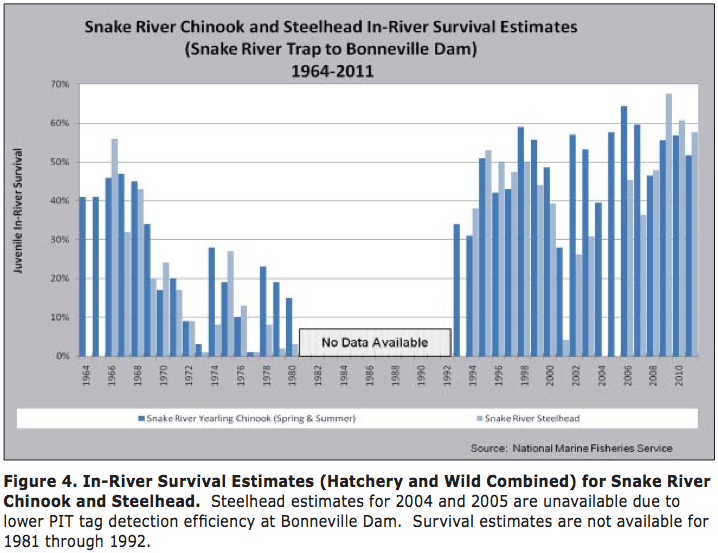 "Second, even using NOAA's flawed and unreliable approach, the planned tributary habitat actions are inadequate to produce the predicted survival increases for many populations of salmon and steelhead. Third, even if the habitat projects have some beneficial survival effects for some populations, many of these effects will not accrue for years or even decades and NOAA will not be able to detect them even then." The estuary habitat plan is similarly flawed, the proposed complaint says. "The 2014 BiOp, like its predecessors, also fails to disclose that implementation of the estuary habitat actions in the RPA have fallen far behind, that NOAA's methodology and model for estimating survival improvements from estuary actions cannot properly be used to predict specific survival benefits from particular actions in any event, and that the survival benefits NOAA is now predicting -- even with improper use of its model -- exceed the total possible benefits identified in that model," the complaint says. The BiOp also fails, the conservation groups say, to properly consider the potential effects of global warming on the Columbia's 13 listed salmon and steelhead stocks, and wrongly assumes that the salmon's diminished status is not affecting the status of endangered southern resident killer whales. Chinook, in particular, are a staple of the whales' diet. "This supposedly 'new' plan once again fails to help salmon or boost salmon jobs, fails to meet the basic requirements of law and science, and fails to lay the foundation for a broadly supported stakeholder process that could work toward shared solutions," said Glen Spain, Northwest regional director of the Pacific Coast Federation of Fishermen's Associations, the West Coast's largest trade association of commercial fishing families. "In some respects, such as cutting back spill, this version is actually a step backward from what's already been thrown out of court as 'illegal, arbitrary and capricious.'" "Despite the proven benefits of spill, expanding it to help recover fish has been largely opposed by Bonneville Power Administration and other federal agencies for nearly 20 years," said Liz Hamilton, executive director of the Northwest Sportfishing Industry Association, the region's largest trade association of sportfishing businesses. The groups also want the court to declare that "the Corps and BOR have violated NEPA by failing to prepare an environmental impact statement that addresses the environmental impacts of, and reasonable alternatives to, the decisions in their 2014 RODs. . .."
The agencies need to "invite the public to be a part of that process," said Earthjustice's Todd True, lead attorney for the plaintiffs in the litigation. Agencies and entities on the defendants' side in the long-running litigation say that continued court battles waste resources and energy. They say the salmon recovery battle is being won. "They are hardly being dragged into court," said Terry Flores, executive director of Northwest RiverPartners. "They are the ones bringing the litigation, despite unprecedented support for this latest salmon plan from federal and state agencies and more than a dozen Northwest tribes." RiverPartners is an alliance of farmers, utilities, ports, businesses and other river users that is a party to the litigation. Most members rely on power produced at the dams, and are billed for the costs of fish and wildlife recovery measures. Much of those costs are paid by BPA, a federal agency that markets power generated in the FCRPS. In recent years BPA has spent about $250 million annually alone for fish and wildlife mitigation expense projects channeled through the Northwest Power and Conservation Council. Much of that expense is ESA related. "For these perennial critics, it is deja vu all over again as they repeat claims they've made for years, despite documented progress that includes the most abundant salmon returns we've seen in decades," said Flores. "Contrary to the plaintiffs' claims, the truth is that the plan approved by NOAA Fisheries accomplishes exactly what the law demands -- and more," Flores said. Federal law demands that federal hydropower dams do not jeopardize fish survival. The salmon plan that's now under fire already meets this standard through the use of new fish-passage technologies and safe levels of spill, according to the statement released by RiverPartners. "For proof of the plan's success, look to the healthy fish returns over the last decade, including the historic return of more than one million fall chinook to the Columbia River last fall," Flores said. "This year, spring chinook returns already are well over that of the 10-year average, and 1.6 million fall chinook and 1.2 million coho are forecasted to return." Three out of four Northwest residents agree that it's critical for dams and salmon to co-exist, according to results of a March 2014 poll conducted for Northwest RiverPartners by DHM Research of Portland. By refusing to acknowledge that the existing salmon plan not only fulfills -- but goes beyond -- the demands of federal law, the plaintiffs show they are out of touch with public sentiment, Flores said. "The hydropower system is doing its part to prevent harm and speed salmon restoration, despite the fact that most salmon mortality occurs in the ocean -- making ocean conditions a much larger factor affecting their survival," Flores said. The legal challenge was filed by Earthjustice on behalf of the following conservation groups, sport and commercial fishing organizations, and clean energy advocates: National Wildlife Federation, Washington Wildlife Federation, Idaho Wildlife Federation, Sierra Club, Pacific Coast Federation of Fishermen's Associations, Institute for Fisheries Resources, Idaho Rivers United, Northwest Sportfishing Industry Association, American Rivers, International Federation of Fly Fishers, Salmon for All, NW Energy Coalition, and Columbia Riverkeeper. The state of Oregon, and the Nez Perce Tribe have in the past been aligned with the plaintiffs. Defendants are NOAA Fisheries, the Corps and the Bureau. A BPA ROD adopting the BiOp prescriptions has been challenged in the U.S. Court of Appeals for the Ninth Circuit. Defendant-intervenors in the lawsuit have included Northwest Irrigation Utilities, Public Power Council, Washington State Farm Bureau Federation, Franklin County Farm Bureau Federation, Grant County Farm Bureau Federation, State of Idaho, Inland Ports and Navigation Group, Kootenai Tribe of Idaho, and State of Washington. States of Idaho and Montana, the Nez Perce Tribe, Confederated Tribes and Bands of the Yakama Nation, Confederated Tribes of the Umatilla Indian Reservation, Confederated Tribes of the Warm Springs Reservation of Oregon, Confederated Salish and Kootenai Tribes and Northwest Power and Conservation Council are among others that have been involved in the litigation.